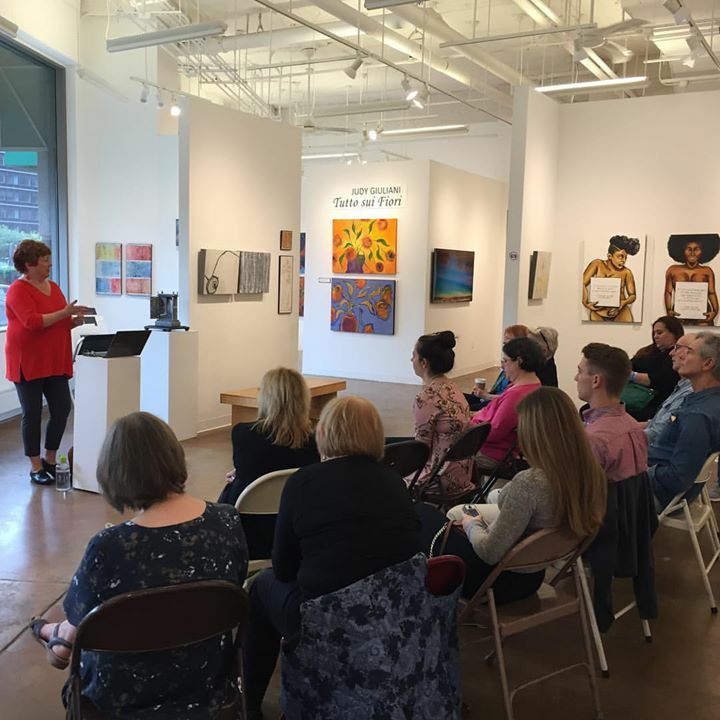 My social media workshop for artists at Touchstone Gallery in Washington, DC, was just over an hour, but got the assembled artists thinking and talking. Afterward, two of the attendees and I were talking about what one of them does: When she has a solo show coming up, she posts photos on Facebook that are close-up shots of her oil paintings. The other artist said she doesn't do something like that, because she thinks that showing all of her show's content will discourage people from coming to see it in person. 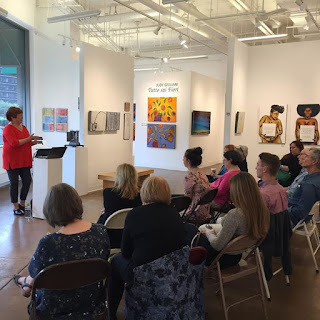 As I listened to them discuss the pros and cons, one fact struck me: The artist who shares advance peeks at her photos on Facebook sold 19 of the 22 paintings she exhibited in her last solo show--many of them before the opening reception was over. Visual appeal: The attendees knew this was the top advantage, but many didn't know why: It's because posts with visuals are clicked on and shared more than those without. Best of all, artists can make their own visual content, which adds even more appeal. Customers: Whether you are struggling or established, your customers are out there...and like no other marketing tool in our history, social media is more likely to reach them, and to reach them at all stages of their buying lifetime, from novice to avid collector. Social media lets you gain their interest, develop a following, keep them abreast of your progress, advertise at rates that even a starving artist can afford, and sell directly and quickly. Constantly changing fresh content: Artists make original visual content, over and over and over again. That's like catnip to audiences on social media, who crave the new and original and never-before-seen stuff. And it's another strong advantage for the artist. Bonus: Sharing your older (but new to them) work also works. In either case, you have a potentially endless supply of original content, something that limits many others. Events: Art is full of events: You win a competition, and there's an announcement. You exhibit at a gallery, and there's an opening reception, an artist's talk, sale days. You're selected in a national juried competition. You move your studio to a new location. And, just as important, you attend your fellow artists' openings, go develop your skills at a distant workshop or local school, travel and get some inspiration you capture in sketches or photos. Whether the event is private and able to be shared, or one to which you want to invite people, social media is your friend. Friends and partners: Who's that? I mean the galleries that exhibit your work; the museums you attend; your customers; your cheering section of personal friends; your neighbors; your buyers; your fellow artists. If you get in the habit of sharing their posts, they'll reciprocate...and help you build your audience. Master one account first: Particularly if you are just starting in social media (and often, even if you are not), mastering one account first will pay dividends later, and makes it easier to start and maintain your social-media presence now. Later, once you've built your central platform, you can use other social channels to amplify it, as I do with my blogs. If selling directly is important to you, explore ads (below) or channels that focus on sharing and selling, from Etsy and Pinterest to Amazon. Post with regularity: Nothing will help you on social media if your presence has tumbleweeds, thanks to your lack of posting. That's one key reason to start with just one account and build it up. A regular posting schedule will build you a following and keep it steady. Share more than you post: Many artists dislike promotional activities, and on social media, there's a great solution: For every thing you post about your own work, post 3 times about the works of others, good exhibits you recommend, art news, and more. It doesn't have to be all about you for it to redound to your benefit. Test out social advertising: One big barrier that social media has toppled is advertising. You no longer need to hire an agency to buy ads for you. You can fine-tune the targeted recipients by geography (a few miles' circumference around your gallery event, for example), by location, demographic data, or keywords in their profiles. And the prices are pretty sweet: Even for as little as $25 to $200, you can reach a lot of people on a site like Facebook in an ad. You can test out audiences, text, images and every other aspect of the ad before you start it, and you can stop it at any time. It's a great way to build followers, to get people to your events, and most of all, to share and sell your art. You can learn more about Facebook ads directly on FB, about Instagram ads here and get more tips on how to stand out among Instagram advertisers here. (I emphasize Facebook for its ease of use and gigantic reach, and Instagram because it's a favorite among visual artists.) You also can read some background articles on Facebook ads in my public Evernote notebook on the topic. Involve your followers: Social media is not a place for the aloof, so get your followers involved. Ask their opinions, share details about yourself with which they can connect, take and post selfies with them at your events, tag them in your posted photos so their friends can see and share. One wedding photographer, while not a fine artist, did what many fine artists fail to do: He posted his photos quickly after the event, tagging those in the photos. Referrals from these posts--his only marketing--built his business (a side gig, actually) to $100,000 a year. Go and do likewise. I've been posting on my personal timeline on Facebook about my art. How do I move to a next-level use of social media? You've got several easy options here. Try promoting or boosting a post to a wider audience, which does not require you to create a new page or presence. If you want to get more data about how many people see your posts, try creating a Facebook business page for your art; you may invite your friends to "like" or follow the page, and over time, you'll get additional followers if you promote the page (think business card, your blog or website, etc.). Or, start on another channel and use it to amplify your Facebook posts. See what posting on Twitter or YouTube or another site will do to drive traffic to your Facebook presence (and vice versa). I'm posting about my art but want to connect Facebook with my website. How do I do that? Here's a tutorial on 6 ways to embed Facebook on your website or blog, from share buttons to embeds of your Facebook feed. I created an Etsy page for my art and nobody came to it. Should I scrap it? Not before you promote its existence more widely. You can do that on any social media channel you're already on, as little as once a week or once a day (and those posts can be pre-scheduled in most cases, to save you time). 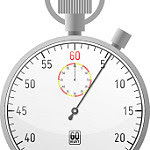 Consistency matters more here than frequency, although you should post with regularity. Promote a selling site also by putting it on your business cards; email signature; profiles on social channels; and other common marketing options you're already using. When you post something new on Etsy, share it elsewhere. No social media will thrive in a vacuum, and you do have to promote your presence on a site like Etsy just as you would a gallery opening. You can make a lot of your social media posts efficient using a free tool like IFTTT (short for If This, Then That) to schedule them. IFTTT stopped supporting Etsy posts directly earlier this year, but here is a workaround. Which sites do I have to be on? I don't think there's any one site (let alone five) that you must be on. Beware of folks who say this or that site is on its way out, or a must for you. Explore for yourself. Your grandkids may abhor Facebook, but your buyers might be hanging out there, in which case, follow the buyers. I love Instagram for personal purposes, but my clients aren't there to do business with me, so I use other sites to reach them. It will take some trial and error--and research--for you to figure out where your work belongs.